Heat in saucepan spoon of oil, fry finely chopped garlic, onion, add fer spoons of tomato paste, mix it, salt, pepper. Spread in form (preferably ceramic). Cut vegetables in thin slices and spread on tomato mixture in striped «snake». Pour vegetable with oil a bit, salt, pepper, sprinkle with herbs. 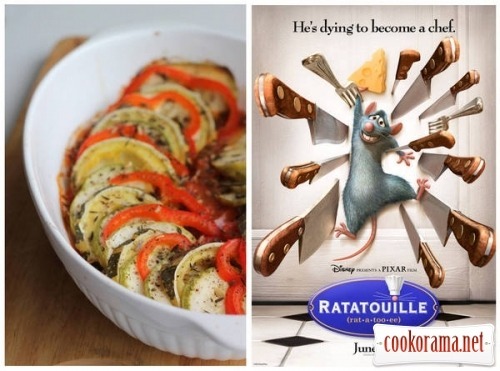 Cover with baking parchment, cut to form, in which you bake ratatouille. Put in oven for 45-55 min, to make vegetables soft, but not mashed, vegetables should not take the brown crust. Excellent dish, fragrant, spicy and almost dietary, excellent both separately and as a side dish.